Our kids have always enjoyed Dr. Seuss books. We went through a phase where that’s all they chose for their nighttime reading. With National Read Across America Day approaching, we’ve been pulling out and reading some of our favorite Dr. Seuss books like One Fish Two Fish Red Fish Blue Fish. We are also on a roll with the Dr. Seuss book inspired projects. 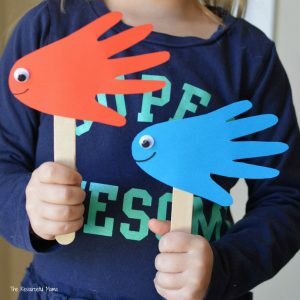 These handprint puppets are our second project inspired by One Fish Two Fish Red Fish Blue Fish. One of my goals for this year was to do more hand and footprint crafts with our youngest two kids. I did a lot with our oldest and have not done as many with the youngest too and wanted to squeeze some in before they are too big. Puppets are a great addition to children’s play. They can stimulate children’s imaginations, encourage creativity, and initiate communication and narration. Our daughter was anxious to finish her handprint puppets and play with them. She has had them out several times since engaging in imaginative play using the puppets. 1. To get started trace your child’s hand on both red and blue paper. 2. Cut out the handprints. 3. Glue a googly eye to each fish on the palm side of the fish. We turned the fish so that the thumb pointed downwards. 4. Use the black marker to draw a mouth on each fish. 5. Attach the fish to craft sticks. We used tape to attach the fish. You could also use a hot glue gun or other strong craft glue. Pull out your dot markers or bingo daubers for some dot painting with this Red Fish Blue Fish Dot Painting Activity. Go back through the book and identify some of the rhyming words in the story. Pull out the cupcake liners and make fish like these at The Kindergarten Connection.